Wright, Bryant. The Stage Is Set: Israel, The End Times, And Christ’s Ultimate Victory. Grand Rapids, MI: Backer Books Publishing. 2017. 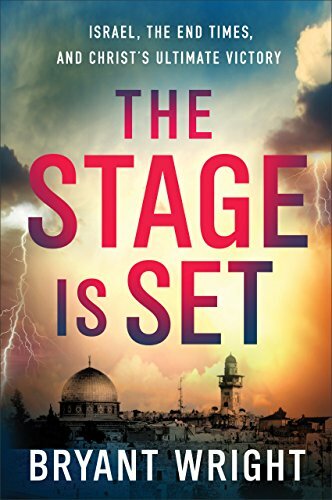 Pastor, founder and chairman of Right from the Heart Ministries, and author, Bryant Wright has led several Bible study trips to Israel and shares his love of the land in his new book, The Stage Is Set. Focusing on the ever-changing current world while recalling God’s promises of the past, present and future, graphs, scriptures, thought provoking ideas and personal stories join together in this book based on the Book of Revelation. Throughout the book, the question begs to be answered, are we ready for the end of times? Well-written and reader friendly, The Stage Is Set offers possible scenarios for which we must be ready. Outlining events in an easy to understand manner, author Bryant Wright challenges his readers. Though I found the book interesting albeit I was not in total agreement on all points, it definitely was worth the read. Making a wonderful Bible study or sermon series, it would also create meaningful faith-filled discussions. Well thought out and organized, this book just seemed to seamlessly flow through the chapters. This entry was posted in Christian Books and tagged Bible, Bible Study, Christian, Christian Author, Christian Book Review, Christian Contemporary, Christian Historical, Christian Non-fiction, Inspirational, Israel, Revelations by Savurbks. Bookmark the permalink.